I'm itchin' to do some stitchin'. There are books on tape waiting for me but I just don't have the time right now to get into the sewing room to create. This is the reason I have had no time. Luc and his brother came for a visit with their mom, our eldest daughter Laila and our youngest daughter, Ayla came all the way from Ireland. Ayla wanted to meet the twin babies and spend some time with these little boys. On the 17th of January, we had our second Christmas but this time with all of my children and all of the grandchildren. It was an ordinary Saturday to everyone else but to us, it felt just like the real Christmas. The menu was exactly the same, the little boys opened their stockings and the adults opened their Secret Santa gifts. In the afternoon, before the turkey, we went for a walk and it really did feel just like Christmas. My son Mark even mentioned that he wondered if some stores were open the next day - thinking it was going to be Boxing Day. The boys are wearing the pajamas I made. They were supposed to be wrapped up and put under the tree but when their flight touched down, they were on the plane (after leaving an hour later than scheduled) but their luggage did not make it. Since they were supposed to go up north to visit the other set of grandparents, they needed clothes to wear so some presents were given to them early. 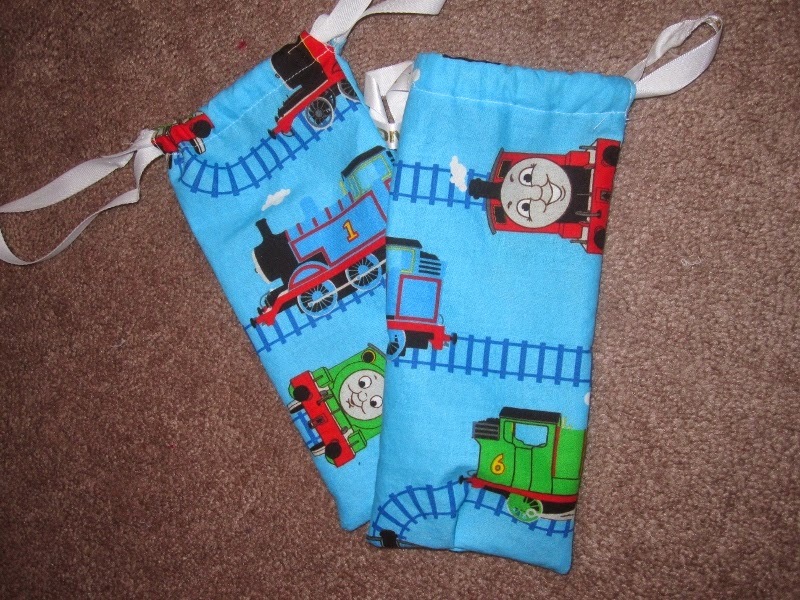 I did manage to finish up these little drawstring bags with the leftover Thomas fabric. Thanks to Mary Anne of Magpies Mumblings for the suggestion. They were already cut and partially put together so it didn't take long to make the casing and thread the ribbon through. I still have to finish sewing a sweater together. All I have left are the side seams so I am hoping to get to that today. On Sunday, everyone goes home and my dishwasher will no longer be running once a day (or more.) That is my gauge for happiness since I know some of my family, if not all, have come home. So, the new projects will have to wait until next week. I hear ya, Dolores. I've had the same problems. Cute kids though. I am sure they are worth the lack of sewing. Dolores, as I read your words, the happiness is right there, and what a wonderful time together. And I'm sure this second celebration was so wonderful, littlies make the day, and to see them have fun with parcels is what memories are for. What a lovely time it sounds. 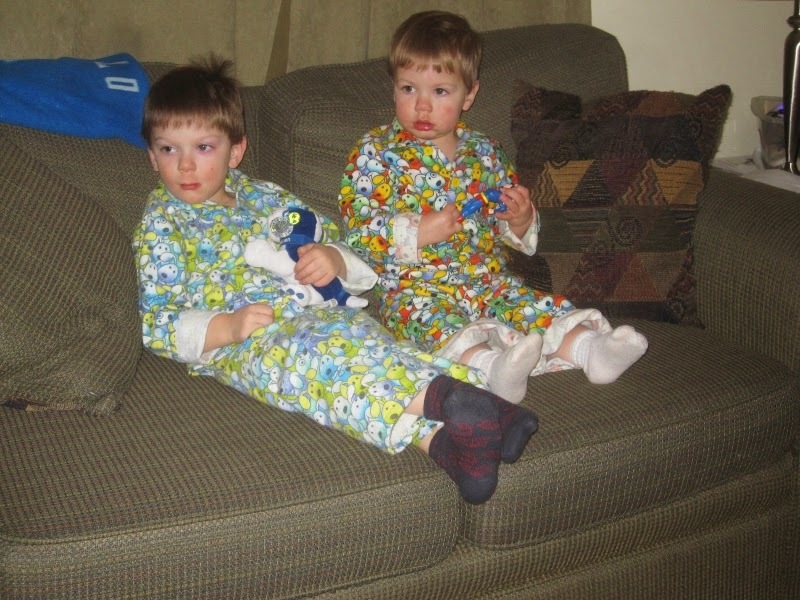 The boys' pj's look just right, and you must have loved being able to give them when needed. How wonderful to have everyone together. The boys look adorable in their jammies. A Christmas with little children is so special, and to have all your own children there at the same time, so wonderful. I can't believe how big the boys are getting!!!! So glad everyone was able to be there Dolores, did their luggage ever arrive?? ?